This is the easiest hack ever, but it’s invaluable. Put your keys on a lanyard or a necklace! If you are a wheelchair user, you might be keeping your house and car keys in a pocket. But you have to shift around to get your hand into your front or back pocket, which stresses your back and your hand. On crutches or a cane, getting out keys might mean leaning up against something or even sitting down to handle devices, anything you’re carrying, plus the keys. So, put your keys on a necklace, a string, a lanyard, or one of those glasses-holding chains. 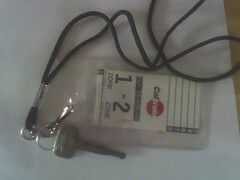 Bus or train passes or ID can hang off a lanyard too in a plastic badge holder. 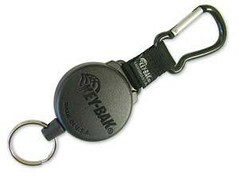 You can also use a retractable keychain, which clips onto a belt loop, your pants, a backpack strap, or whatever. Personally, I like keys around my neck, keeping it to just two or three keys. And I think a transit pass would be better kept on a “Key-Back” clipped to the inside of a backpack, so it’s handy and doesn’t get lost. Making lovely custom “key necklaces” could be a great project to make and sell on Etsy, out of necklace materials, or from velvet cord or embroidered ribbon. They would need to be sturdy and yet as light as possible to avoid irritating a person’s neck or shoulder. Here is a craft business opportunity which is easily extendable to many uses! I wonder if height is an issue in preferring neck lanyards or retractable keychains — I’m a little on the tall side and it makes me crazy when I have to bend down to get a lanyarded key into a keyhole, especially if I’m dizzy or headachy that day. A retractable clip on the waistband or pocket is a better solution for me. Now we need to figure out how to customize those so they’re pretty!